MPLS, or Multi Protocol Label Switching, is quickly replacing frame relay and ATM as the technology of choice for carrying high-speed data and digital voice on a single connection. MPLS not only provides better reliability and increased performance, but can often decrease overall costs through increased network efficiency. Its ability to assign priority to packets carrying voice traffic makes it the perfect solution for carrying VoIP calls. MPLS is a form of protocol, rather than a specific type of service. It can be used to deliver any type of circuit that a customer needs, from IP VPNs to optical connectivity. The key to MPLS is its ability to label data packets. In traditional IP networks, packets are routed based solely upon the data's network-layer header. The arrival of each packet forces a router to "decide" where it should go next with no regard for its actual content. MPLS greatly speeds up the routing process by labeling each packet as it arrives on the network. Each network router stores information on how to handle different packet types, as indicated by their header label. This directly translates to higher efficiency by lightening the load on an organization's routers and freeing up needed resources. Speed of packet transmission is increased as the load on network infrastructure is reduced. The inherent advantages of MPLS are most noticeable in situations where real-time traffic is configured to be given preference over data packets that do not require the same amount of speed or priority. With a traditional IP circuit, all traffic is treated equally. This becomes a critical problem when demand for bandwidth temporarily exceeds the capacity of the circuit. The only form of prioritization on most traditional IP networks is "first come, first served", with no special treatment being given to real-time sensitive traffic like voice and video conferencing. As an example, a large e-mail attachment of personal photos being sent to an employee's personal mail account would normally receive the same network priority as a real-time video or audio conference being held by company executives. The result can be phone calls or video transmissions of inferior quality, as the two sources battle against one another for priority. An MPLS network on the other hand will instantly assign a high priority to real-time voice and video. E-mail traffic and other connections that are not as likely to be affected by latency will be pushed to the back of a router's queue to make way for high-priority traffic. This noticeably improves the performance of real-time applications and has a minimal effect on lower priority traffic such as e-mail, where a delay in milliseconds is almost impossible to detect. 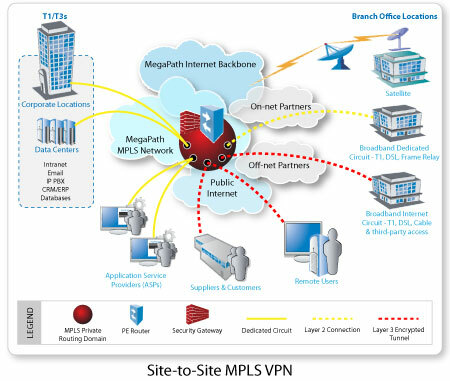 In a nutshell, MPLS puts your high-priority, mission critical IP traffic in the fast lane to its destination. All of this is done seamlessly, with absolutely no interaction needed on the part of the customer and with no significant changes to their network infrastructure. It's like having a network engineer inspecting each and every packet on your network, and deciding how to load balance the circuit based upon the data's importance. MPLS is truly a value-added service that can pay for itself each and every month. 1. Cost savings. Depending on the specific mix of applications, and network configuration, MPLS-based services can reduce costs by 10% to 25% over comparable data services (frame relay and ATM). As companies add voice and video traffic, cost savings can rise to as much as 40% networkwide. 2. QOS enablement. One of the primary benefits of MPLS-based services is the ability to support QoS, particularly key for companies that are rolling out voice and video. 3. Improved performance. Because of the any-to-any nature of MPLS services, network designers can reduce the number of “hops” between network points, which translates directly to increased response time and improved application performance. 4. Disaster recovery. MPLS-based services improve disaster recovery in a variety of ways. First and foremost, data centers and other key sites can be connected in multiply redundant ways to the cloud (and thus to other sites on the network). Secondly, remote sites can quickly and easily reconnect to backup locations if needed (unlike with ATM and frame networks, in which either switched or backup permanent-virtual-circuits are required). That’s why several benchmark participants listed “flexibility for business recovery” as a key justifier behind their MPLS rollouts. 5. Futureproofing the network. Most companies have come to the conclusion that MPLS represents “the wave of the future.” Investment in legacy WAN services (ATM, frame) has pretty much come to a standstill: Virtually no companies plan to invest in ATM or frame services within the next six to 12 months. As a result, companies increasingly say they’re planning to migrate to MPLS primarily to avoid being left behind. Top 5 list courtesy of Network World. Reprinted under fair use.